It’s been a long time, but Pretty Little Liars is finally becoming the show we all know it can be! With higher stakes and new threats, “Do Not Disturb” was a game changer! In a continuation from last week’s cliffhanger, we learn the secret Byron (Chad Lowe) has been keeping is his re-engagement to Ella (Holly Marie Combs). We also learn the reunited couple was together the entire time on the night of Charlotte’s murder. While this seemingly wraps this storyline in a neat bow, we still don’t know what Byron was talking about on Ezra’s answering machine or why his golf club is missing. After receiving a text from Devil Emoji about the missing security footage, Hanna (Ashley Benson) questions Ashley (Laura Leighton) but gets no answers. This prompts Hanna and Aria (Lucy Hale) to have a scavenger hunt montage where they search cereal boxes and other obscure locations around the Marin house with no luck. However, they decide to take advantage of Devil Emoji “thinking” they have the drive. Caleb (Tyler Blackburn), being the genius techie that he is, equips Hanna with a hard drive and she makes the delivery in a trash can of Devil Emoji’s choosing. Meanwhile, upon returning to New York, Hanna ends up having enough of her boss’s constant bullying and gets fired. Even when she is given the option to be rehired, Hanna informs her how she has been pushed around by a lot worse than her. Seeing Hanna no longer be a pushover and be “Hanna” for a change was one of the most refreshing aspects of the episode. She seems to have some regrets when she confides in her fiancé, Jordan (David Coussins), in the back of a car. But even when Jordan asks if she wants to return to Rosewood, Hanna says to keep driving. Where will they end up? Dr. Rollins (Huw Collins) tries to persuade Emily (Shay Mitchell) to be there for Alison (Sasha Pieterse) during this difficult time, but the good doctor decides to back off after he accidentally sees paperwork for Emily’s egg donation. Ali decides to meet up with Emily on her own and tells her former flame how she thinks Sara (Dre Davis) actually cared about Charlotte since the creepy shower-loving former A accomplice asked Ali if they could meet up to put together the complicated pieces of the Charlotte puzzle. Can they resolve those plot holes too? That would be nice! After mistakenly thinking Dr. Rollins told Ali about her upcoming egg donation, Emily accidentally lets it slip. Ali ends up accompanying her during the procedure where Emily hallucinates (or is it?) a vision of Sara holding her down and injecting her with a needle. After the procedure, Emily learns the couple who was planning to take Emily’s eggs ended up backing out because they got pregnant on their own. Emily is given the option to either freeze the eggs or destroy them. She decides to donate them to another family. 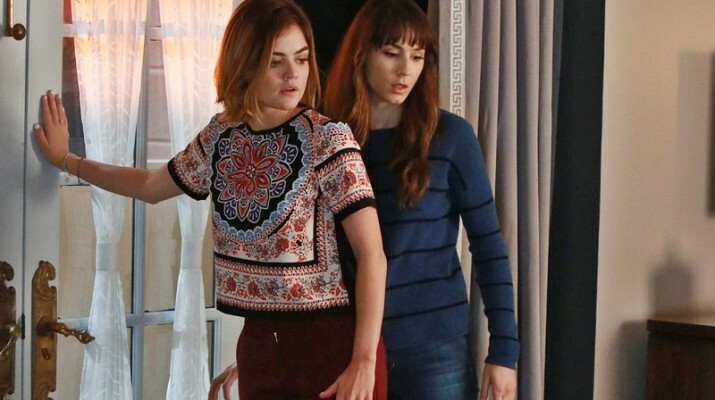 Finally, it feels like the liars’ new stalker is actually raising the stakes! It makes you wonder if Devil Emoji will implant Emily’s eggs into one of their worst enemies. Sara? Jenna? Someone else? The storylines are endless for this and it adds an extra layer of excitement the show has been missing for awhile. Spencer (Troian Bellisario) plans to meet someone else for lunch but it ends up becoming a lunch with Yvonne Phillips (Kara Royster) that she didn’t schedule. She wonders if Devil Emoji possibly canceled her original lunch plans and scheduled them with her ex-boyfriend’s new girlfriend instead. Spencer plays it off and decides to enjoy the impromptu date. At the end of their spontaneous get-together, Yvonne leaves her phone behind. Instead of tracking her friend down, she decides to give the phone to Caleb so he can track down who rescheduled Spencer’s lunch date. But what Caleb finds is more surprising: password protected research on the Hastings family! More mysteriously, Mona (Janel Parrish) is quick to get Yvonne’s phone back from Spencer and assures her Yvonne will never know it’s missing. While we know Mona is working for the Hastings opposition, Parrish’s role in the show seems a little random now. Outside of being a red herring and a character whom we are never sure about trusting, Mona hasn’t really had much purpose in a long time. While Parrish does excellent work with the scripts she is given, it makes you wonder why the writers even bothered bringing Mona “back from the dead” if they aren’t going to give her interesting storylines. It’s been a long time but we finally got the long-awaited reunion for Team Sparia complete with Spencer telling Aria, “Come on, little big one.” It had us tweeting #FriendshipGoals for days! But anyway, back to the plot. Aria overhears Sara and Ashley talking about the hotel policy of the rooms being cleaned at least once a week but Sara is adamant about not being disturbed. Spencer and Aria break into Sara’s room to find the room completely spotless. After all, the girl loves showers. She must love keeping a clean room, right? While Aria is looking through Sara’s closet, Spencer finds floor plans for the Radley Sanitarium and the Radley Hotel. When Spencer compares the floor plans, she learns Sara’s room is the same room Charlotte stayed in. Spencer wanders into the closet to find a hole in the wall with a ladder leading downward. Aria seems to have investigated on her own down there. Did Aria really leave Team Sparia without mentioning anything? How rude! We see hands insert the hard drive into a computer. Rather than the security footage Devil Emoji was hoping for, (s)he gets a video of Caleb saying that they are going to change the rules of the A game as well. The defective drive ends up giving Devil Emoji’s computer a virus. Finally, the stakes are raised! This episode of Pretty Little Liars proved the show has the potential to be the fantastic mystery series it once was. With the hidden room at the Radley, a threat to Emily and a return to Hanna’s original self, it’s putting the show in a new and exciting direction. Now if only the writers can give Mona something better to do than being a red herring. What do you think about the raised stakes in Devil Emoji’s game? Are you bored with Mona? Sound off in the comments below! Previous ArticleTV Review: 'The Fosters' 3 x 13 "If and When"
Next ArticleTV Review: Shadowhunters (1x05) "Moo Shu to Go"